Welcome to my little spot on the First Japanese Sewing Week Tour!! For those who are visiting for the first time, I began sewing from Japanese patterns back in 2013. I loved the clean lines of the patterns I kept seeing, and I was eager to accept the challenge of trying to decipher a pattern in another language. Plus, I purchased my first book on a fun trip to NYC! I just counted my Japanese book library, and I was surprised that I have 10 at my disposal!! Many of these are the recently translated books by Tuttle Publishing. I have sewn from most of the children's books, and I have done several book reviews for children's and women's books. You can find all of these previous posts here. The pattern I chose comes from the Japanese sewing book: Heart Warming Life Series: Chiisana Onnanoko no Oyafuku (Clothes for Little Girls)by Yuki Araki. I have previously sewn patterns S, S, H, K, and a modified L from this book. This is pattern T from the book. Most, if not all, of the patterns in this book are created with stretch fabrics. Again, you see the clean, simple lines, but with sweet details like the belt and bubble hem. And button back. I was thrilled to find the vintage buttons in my stash that perfectly matched the vintage velvet ribbon I used for the belt. Based on her measurements, I made size 105cm which is a perfect fit. The pattern calls for a fabric belt, but I loved the idea of using this velvet ribbon. I had to press back the edges of the ribbon to fit my belt buckle, so I sewed them down with gold thread. I love the fancy touch the belt gives to the knit dress. The pattern did not call for an belt loops, but I knew they would be helpful. I followed this tutorial for thread belt loops. So easy!! For those of you who are curious, this is what the pattern looks like inside the book. Most of the time you can get away with strictly looking at the detailed diagrams. They really are superb! The other day someone posted about using the Google Translate app for Japanese sewing patterns. (Thanks Ajarie!) This is a total game changer!! Simply take a photo of the text you would like to translate within the app, highlight the text, and it will give you a translation. How cool is that!?! I thought I would include a couple more tips for those who might be interested in diving into Japanese patterns for the first time. Every Japanese pattern I have used does not include a seam allowance. Tracing with two pencils tied together is a fast, simple way to add a 1/4" to 3/8" seam allowance. Once you've traced all of those pattern pieces, a good storage option is a mailing envelope with a copy of the book cover taped to the front. Ok, just two more photos showing the dress layered. Glad this comfy dress with work for all seasons! Now here's more fun! 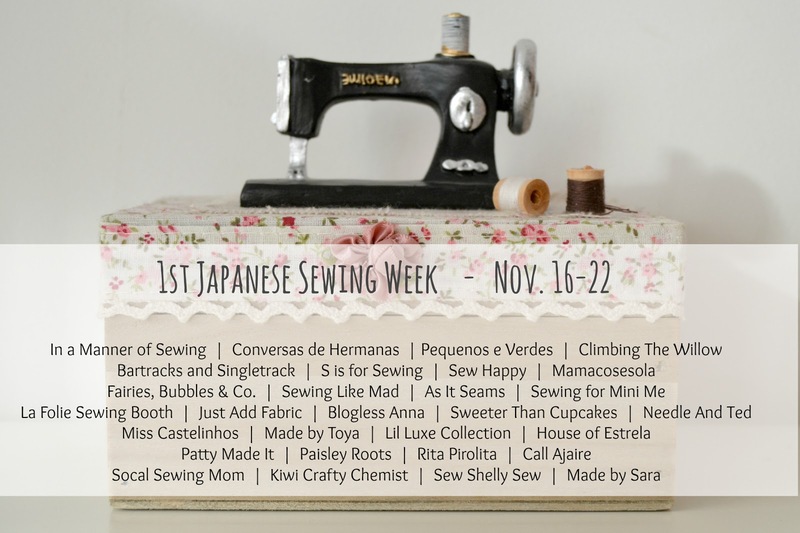 First, be sure to visit all of the other sew along participants on the Japanese Sewing Week tour. Next, head over to Made by Sara for all the details on how you can sew along for a prize. Finally, there are prizes to be won just by entering below. Best of luck!! So helpful!! Hope it works as well for you! What a pretty dress! I love the belt, too. It really does make it so special! Thank you! Comfy and special are the perfect combo! Beautiful dress,!!! I love the details you put with the turquoise colour. The app really is helpful! I'm on a roll with navy lately. So many lovely combinations to create with it! Oh, I love this book so much (no, I don't have it, but I keep wishing I did). The dress is brilliant on her - the colors, the styling. Love it!! And thank you for the storage tip - usually I use office binders, but I might give your idea a try. Sounds much easier. I have binders for PDF's too. I guess I haven't settled on the perfect system! Cute little dress, and the velvet ribbon is a great addition. The dress is lovely and the belt detail is adorable!! I also have that book but haven't made nothing from it yet! Yes! You should definitely buy this book. It's a winner! I'm a little jealous of her hair too. Mine is straight as a board. She got the curl from Daddy. It is Google Translate by Google Inc. I hope this helps!